In June I was invited as media to the Mekong Tourism Forum 2017 (MTF 2017) in Luang Prabang, Laos PDR (Peoples Democratic Republic). Laos has been on my to-visit list since we arrived in South East Asia ten months ago, so this was the perfect excuse to visit. After much deliberation, I decided to fly into the capital Vientiane and out of Luang Prabang, extending my stay to 16 days. This meant I could attend the forum and do a whistlestop tour of Northern Laos before and after it. 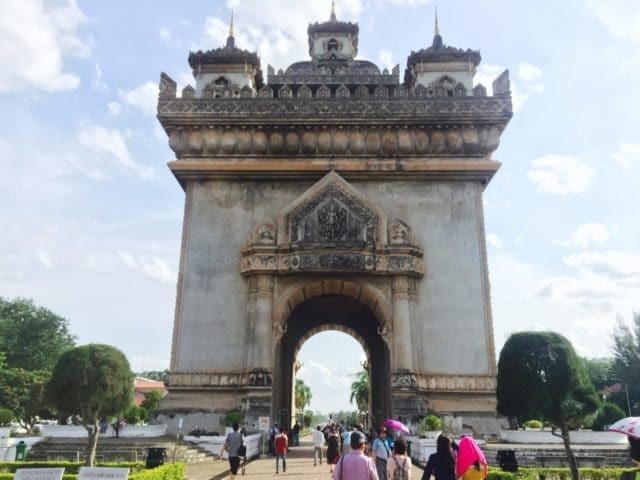 I hadn’t read many positive things about Vientiane, but it made the best starting point for my route, so I was willing to give it the benefit of the doubt. Located on the Mekong River, Vientiane is probably the smallest capital city in South East Asia. I arrived after a pretty non-eventful two-flight journey from Siem Reap, the highlight being a visit to Boots the chemist during a three-hour transit in Bangkok. I was finally able to stock up on much-needed toiletries and makeup that isn’t available in Cambodia. Obtaining my visa on arrival and getting through immigration went smoothly, as did catching a taxi from the airport to the city centre. You can book and pay for a taxi at a counter in arrivals. It cost 57,000 Laos kip (LAK) or £5.40 GBP; a little over-priced but it was getting late and I couldn’t be bothered to leave the airport to find a taxi myself. It was only a short drive to my accommodation Phonepasueth Guesthouse, which is conveniently located just a 10-minute walk from the Mekong River. Despite the late hour the reception staff welcomed me with a smile, showed me to my room and gave me a map and directions to where I might find still be able to find food. My room was small and basic, but clean with a comfortable double bed, TV, air-con, and fan. It was more than adequate for a couple of nights but again felt a little pricey at 152,960 LAK (£14.54 GBP) a night, given that breakfast wasn’t included. By the time I’d checked in it was already 10:30 pm, so I quickly changed and headed out to find some food and a beer. This proved a challenge as most places had stopped serving! The first place I tried was Mix, an open-air food court style restaurant in the Nam Phou Fountain Square. There appeared to be a number of different cuisines on offer but unfortunately, only drinks were available when I arrived. I decided to venture a little further to the riverside where several restaurants and local eateries line the road. However, these were either empty, about to close, or already closed. Just as I’d resigned myself to a supper of Pringles and Oreos I stumbled across a little Vietnamese restaurant called Little Hoi An. A couple of people still in drinking beer and to my relief, they were still cooking. They looked as if they were about to start clearing tables though, so I just ordered a snack of Vietnamese Spring Rolls to tide me over until morning. The spring rolls were 29,000LAK (Laos kip) or £2.75 (GBP), and a large bottle of Beer Laos was 16,000LAK (£1.50). So far the prices seemed to be on a par with Siem Reap, a little on the expensive side for SE Asia but to be expected. Vientiane is a capital city and firmly on the tourist (banana pancake) trail after all. As I walked back to my guesthouse the odd tuk tuk driver would stir in his hammock and ask “tuk tuk?”. These tuk tuks were one thing that was different to Cambodia – they were much bigger than the motorbike based ones we’re used to. They’re built on a pickup truck chassis and hold up to ten people along two benches down the sides. More can squeeze in if people hang off a platform at the back, local style. 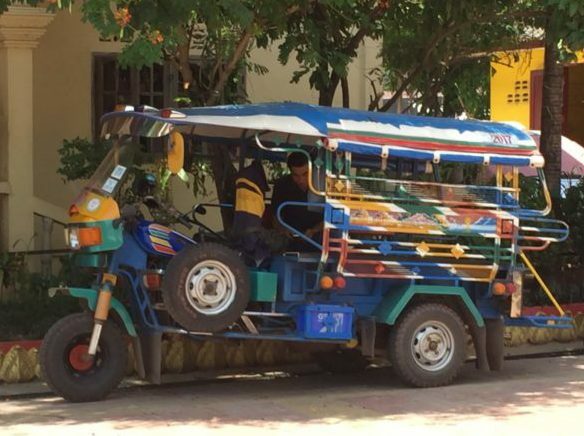 The official name for a Laos tuk tuk is ‘Songthaew’, meaning two rows. Pretty tired I crashed out about 11 pm, I only had one day to explore Vientiane and wanted to get a reasonably early start the next day. Next morning after a good nights sleep, I rented a bicycle for the day for 10,000LAK (£0.95) plus a 200,000LAK (£19.00) deposit from a nearby guesthouse. It was ‘integration and assimilation’ time for Laos. As you may have seen from previous posts, whenever Andy and I first arrive in a new country we like to get a feel for it, its people, its culture, and how things work. I had several key sights in mind that I wanted to see and the rest I’d play by ear. As soon as I started cycling I noticed how much quieter the streets were compared to Siem Reap. I think this was partially due to the fact that Vientiane seems to awaken quite late. As the day wore on though I noticed there was also much less traffic on the roads (especially tuk tuks and motorbikes), whilst cars seemed to be more common. Hassle from tuk tuk drivers was more subtle too, if you say no, they didn’t really try to persuade you, they just accepted it and resumed their hammock nap or chat with friends. As I cycled through the back streets searching for breakfast it soon became apparent there was the strong French influence on the city. There’s French colonial architecture, road signs, bakeries and cafes, and a replica of the Arc de Triomphe – Patuxai, or Victory Gate as it’s known. Dotted amongst all of this, on streets lined with tamarind and palm trees, are colourful Buddhist temples and shrines, and traditional homes. The Lao and French features make a nice contrast and complement one another surprisingly well. Approaching a T-junction a big, vibrant fruit display on the corner caught my eye. It was at the front of what appeared to be a juice bar and I stopped to investigate. Noy’s Fruit Heaven was actually a little cafe/ restaurant with a great selection of fruit juices and shakes, and fruit salads, along with a selection of (mainly) healthy foods (Lao and Western). As my stomach was trying to eat itself from my lack of food the previous day, I opted for their Falafel Pitta and chips (healthy breakfast I know), which was 38,000LAK (£3.60). I also had a mixed fruit shake which was 15,000LAK (£1.40). They were delicious and set me up for a full day of cycling around the sites. 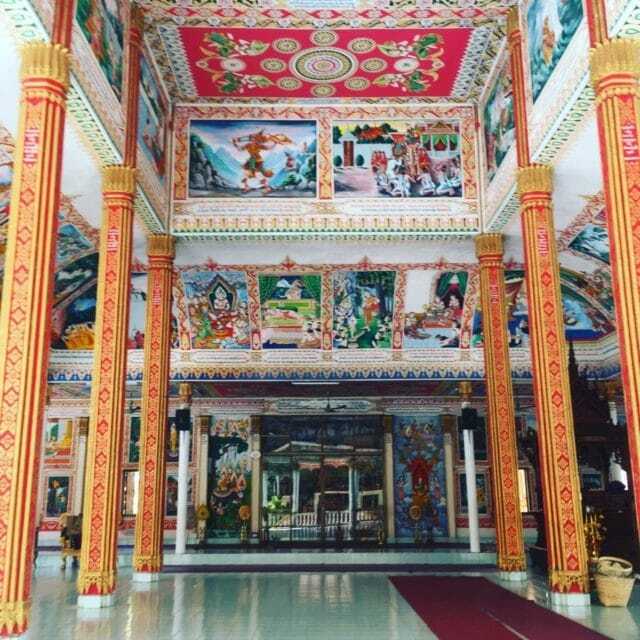 If you like temples (or Wats as they’re known in Laos) and enjoy a spot of temple hopping, then Vientiane has many to keep you occupied. Armed with a paper map from my guesthouse and google maps (I’d bought a local sim card and data), I cycled between four of the main ones. Wat Ong Teu – rebuilt in the 19th and 20th centuries after being destroyed when the Siamese attacked the city, this red and yellow temple is now the national centre of Buddhist studies. Whilst it’s not the most spectacular Wat in Vientiane, its convenient central location makes it easy to visit. 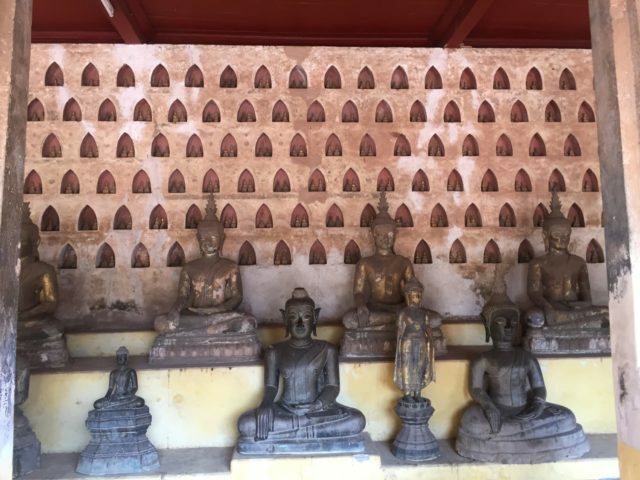 Wat Si Saket – Vientiane’s oldest surviving temple escaped being destroyed in multiple bombings and invasions. Despite being in need of a little restoration it still has many lovely features, including a Thai style roof with 5 tiers, verandas, and shaded gardens. The most interesting and differentiating feature has to be the thousands of Buddha statues (about 6,800). Large sitting Buddhas line the cloister walls around a central courtyard and behind these, set in alcoves, are many, many smaller statues. Wat Ho Phra Kaew – now used as a museum rather than for religious purposes this temple has a 10,000 kip (£0.95 GBP) entrance fee. It was originally built in 1565 to house the sacred Emerald Buddha which was stolen from North Siam (Thailand). The statue was reclaimed by the Siamese in 1778 and now rests in Bangkok in Wat Phra Kaew. Even lacking the Emerald Buddha, Wat Ho Phra Kaew is still worth visiting. Stone bannisters take the form of dragons which face the tidy gardens that offer a peaceful, calm space to escape from the hot sun. Wat Si Muang – well known for bestowing luck and good fortune, this is a small but busy temple with a stream of visitors. Buddhist devotees come to receive blessings from the monks and make wishes in one room and to give offerings in a second room. There are several vendors near the gates selling incense, candles, flowers and (unfortunately) caged birds to be released to earn merit. This was my favourite Wat of the day so far, it had a lively, positive feeling to it and it was interesting to watch the devotees and monks. I was charged 3,000LAK (£0.29) at the gates but I’m not sure if this was an entry fee or a charge to leave my bicycle there. If you do decide to go temple hopping, please remember to dress respectably with shoulders and knees covered and to always remove your shoes before entering a temple. After Wat Ho Phra Kaew I was a bit worn out and needed a rest and refreshment, so an iced coffee seemed the obvious choice. I’d read good things about the Little House Cafe, rumoured to serve the best coffee in Vientiane, so decided to pop in. It’s a small, quaint cafe and slightly difficult to find as it’s hidden down a little back street. It also doubles as a handicrafts shop selling locally made cotton and silk items. With its comfy wicker chairs and peaceful atmosphere, it’s an ideal place to while away some time with a book. I’m no coffee connoisseur (having only started drinking it recently) but the Iced Cafe Au Lait was just the pick-me-up I needed to resume my cycling tour. It felt a little on the pricey side at 26,000LAK (£2.47), but what am I to know with my limited coffee knowledge! 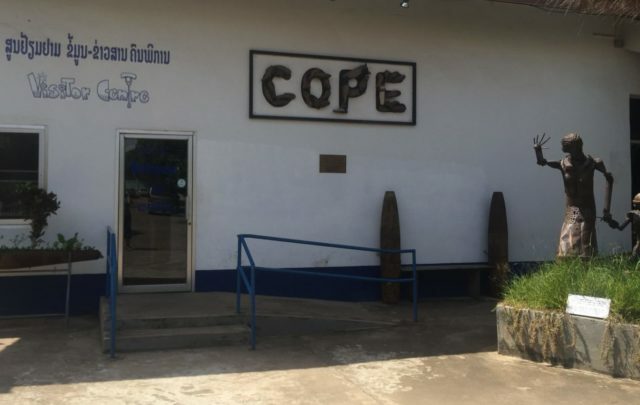 Next up was the COPE (Cooperative Orthotic and Prosthetic Enterprise) Visitor Centre, I’d suggest if you only have time to do one thing whilst in Vientiane then this should be it. You may or may not be aware but Laos is the most heavily-bombed country (per capita) in history. Between 1964 and 1976 over two million tons of ordnance was dropped on Laos by the United States. This is equivalent to a planeload of bombs every eight minutes, 24/7, for nine years…can you imagine that?! Roughly a third of these bombs, many of which were cluster bombs, never detonated, resulting in large areas of the country being transformed into huge minefields. 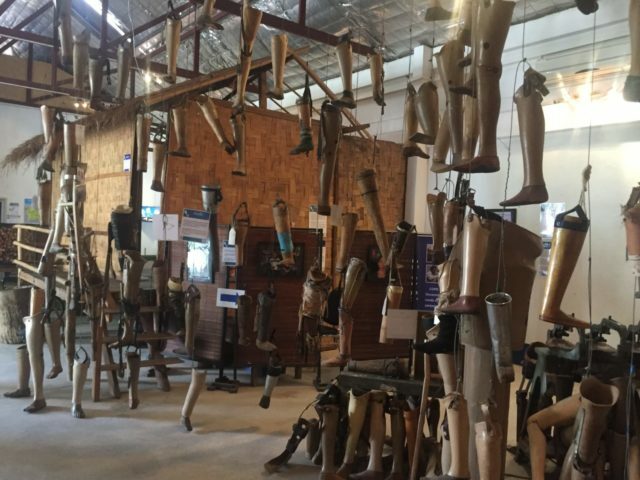 This means that since the war ended thousands of people have been killed or maimed by accidentally triggering unexploded ordnance (UXO). Every day many Lao people are at risk just going about their everyday activities. Farming, cooking over an open fire, and children playing could all result in the unthinkable. COPE is a local charity that was set up to help those who have been victims of these unexploded bombs. It provides prosthetics for those who have lost limbs and offers the support they need to help them get on with their lives. The COPE Visitor Centre educates visitors about the devastating effects and after-effects of the war and the risks posed by UXO strewn across the country. It also does a great job of highlighting the amazing work the charity does for victims. There was no entry fee but if you want to help you can leave a donation or buy something from their shop. I must admit I found visiting here to be a sombre, harrowing and thought-provoking experience. It was a real eye-opener and gives a fundamental understanding of what this country and its people have been through. Leaving the COPE Visitor Centre deep in thought I cycled to the large gated complex which is the home of Pha That Luang, otherwise known as the Great Sacred Stupa. This is the most sacred monument in Laos and is believed to contain the breastbone of Buddha. It is also a national symbol, appearing on banknotes and on government logos. The main stupa itself is a big, square, gold structure made up of three tiers: the base, the body and the spire, which looks like a long thin lotus bud and is 45 metres high. I’d heard there was an entrance fee of 10,000LAK (£0.95), but I didn’t see a ticket office or anyone taking any money so I wandered around free of charge. The whole complex sprawls across a large gated area and in addition to the Sacred Stupa there’s also a giant reclining gold Buddha, several other Buddhist temples, a Convention Centre and some pavilions, all set in attractive gardens. The interiors of many of the buildings were adorned with stunning murals. My absolute favourite was a pavilion near the entrance. It had some amazingly intricate, bright, brilliantly coloured wall and ceiling paintings, which I spent a good twenty minutes admiring. The main stupa was currently under renovation when I visited so I was unable to get inside which was a shame but it was still worth a look. I just wished I’d visited early morning or early evening as the heat of the sun was almost unbearable (and I like the sun). By then I was getting really hungry again and had my heart set on PVO Vietnamese Food (which I’d heard rave reviews about) for a late lunch. First I thought I’d make a quick stop at Patuxai Monument. This translates to ‘Gate of Triumph’ and it does bear a striking resemblance to the Arc de Triomphe in Paris. I thought “at least I’ll have time to look at the riverfront area before it gets dark and maybe grab a quick bite to eat too”. I cycled all the way along the riverfront, where people strolled and looked over to Thailand on the other side, then cycled back on the other side of the boulevard. On the eastern side, there was a lovely park with lots of trees and shaded areas, along with some exercise machines where locals were energetically working out! A little further on the road got busier as everyone and their dog milled around, whilst the night market was being set up. As the sun was starting to go down I decided it was time to find somewhere to set up camp for a while. I opted for the first rooftop bar I could find, which turned out to be the popular Bor Pen Nyang Restaurant and Bar, directly opposite the night market. The big open space is on the 5th floor of the building, it’s set around a large central bar, and boasts two pool tables. There is also a balcony all along the front which is where I found myself a prime spot and ordered a Beer Lao. They ‘accidentally’ bought me out a pitcher…ooops, I was able to convince myself (didn’t take much) to keep it, after all, it was only about two pints and just 25,000 kip (£2.40 GBP). The clientele seemed to be a mishmash of locals, tourists, and backpackers, there was a good, friendly atmosphere and I expect it can get very busy as the evening wears on. I considered getting something to eat as I’d had hardly anything yet that day but realised there wasn’t much point as it was nearly 5:30 pm, so I might as well wait until dinner. It wasn’t the best viewing point for sunset but it was a great spot to sit and watch all the bustling activities going on below me. 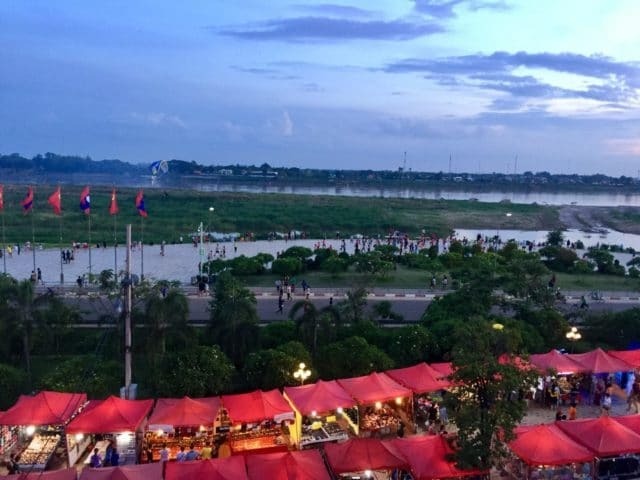 There were the bustling red-canopied stalls of the Vientiane Night Market directly across the road, an aerobics class in full flow near the riverfront, a paraglider soaring back and forth over the river and a view of Thailand which seemed to be just a stone throw away. By the time I’d finished my pitcher of beer it was nearly dark, so I hurried back to the hotel to freshen up. After a quick shower and change, I walked back to the riverfront to explore the Vientiane Night Market. Although it seemed to be geared towards tourists, it was mainly locals wandering around the stalls. The vendors were selling products which were typical of most SE Asian night markets: one size fits all dresses and trousers, souvenir t-shirts, cheap sunglasses, shoes, handbags, paintings and other souvenirs. If you’ve not been to many night markets before it’s worth spending some time exploring, however, I’ve been to ALOT so I walked from one end to the other fairly quickly. My main goal for the evening, after all, was to find some good street food. 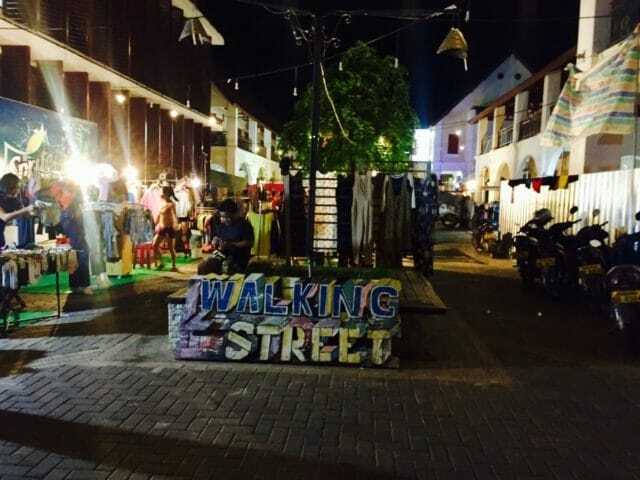 Earlier in the day, I’d read a couple of reviews about Walking Street. Apparently, a pedestrianised area open from 4 pm to 10 pm where an amazing selection of street food could be sampled. Being a bit of a foodie (and having eaten hardly anything the last couple of days) it was a given that I had to have dinner there that night. I’d spotted a sign for it (or so I thought) when I was cycling earlier in the day so, on emerging from the Night Market I hot-footed it in that direction. It turned out this wasn’t ‘The’ Walking Street I was looking for but a second one…unfortunately there was only about two stalls in this one and they were packing up. Undeterred I got onto Google Search and eventually managed to find a map with directions to the Walking Street that I was looking for. It was at the other end of the city so I jumped in a tuk tuk and with lots of hand signals managed to successfully direct the driver to where I wanted to go. It was in the centre of the Vientiane New World shopping district, near the river and more a crisscross of streets with small open areas, rather than just one street. As I approached from the road all kinds of delicious cooking smells wafted my way. I pottered around, stopping to investigate what every stall had to offer. 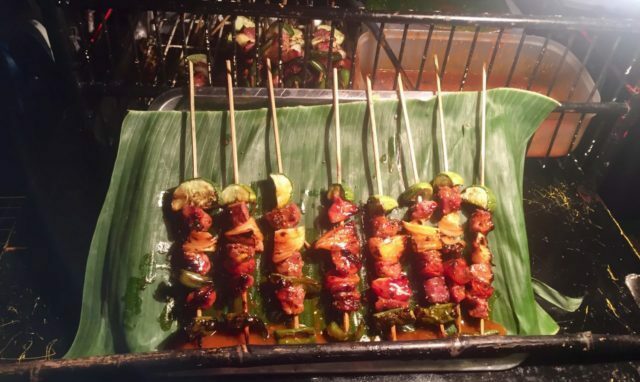 There was and abundance of different street foods including meat (pork, chicken, and beef) and pepper kebab skewers, traditional Lao hotpots, pork dumplings, soup, noodles, and ice cream and churros for dessert. Neon coloured non-alcoholic crushed ice drinks were also being sold at the H2O Cafe, and of course, beer and soft drinks were available everywhere. Nearly every stall had its own small seating area, and feeling spoilt for choice I finally opted for some pork, pepper, onion and tomato kebabs which were cooked over a traditional coal BBQ. At 4,000LAK (£0.40) each they were a bargain. They were also delicious and I quickly demolished four dipped in very hot chilli sauce, along with an obligatory can of Beer Laos. After that, I just sat and people watched for a while soaking up the atmosphere, sights, and smells. I lost track of time and suddenly realised it was nearly 10 pm, four kebabs wasn’t going to cut it so I went to find some more tasty morsels, only to discover that yet again I’d left it too late; all the stalls were closing! If only I’d found Walking Street earlier I could have had a huge street food extravaganza; I really wasn’t having much luck on the food front on this trip so far! For anyone that knows me, you’ll understand how much I hate food disappointment and how gutted I was! That night I really did have to resort to a Pringles and Oreo picnic on the bed. If nothing else, at least it was a cheap meal. I made up for the recent lack of food the following morning with a monster tuna, cheese and salad baguette from the Swedish Bakery. At 35,000LAK (£3.34) this was on a par with UK prices but it was really very tasty and filled me up for my bus journey to Vang Vieng. 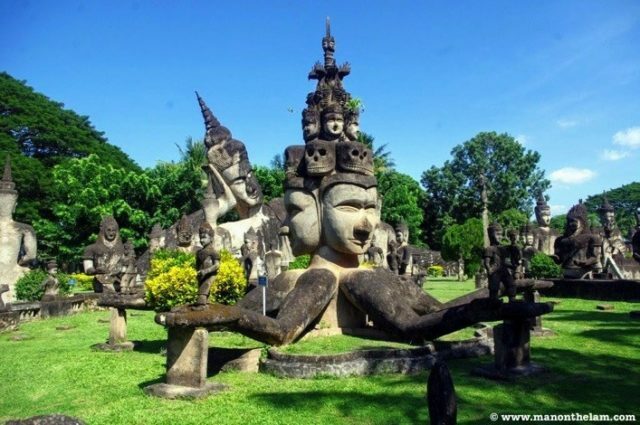 One place I’d really wanted to visit whilst I was in Vientiane was Buddha Park or Wat Xieng Khuan. This park contains a collection of Buddhist and Hindu sculptures which are the creations of a wayward monk. It sounded like just the sort of obscure, weird thing that would interest me and initially, I’d planned on cycling there. That was until the staff at my guesthouse nearly laughed me out of town at the suggestion. Apparently, it was about 25 km out of town and would take me all day to get there and back. The other options were to go by tuk tuk, the cost of which was way outside my budget, or to get a public bus, taking about half a day which I still didn’t really have time for. Reluctantly I admitted defeat, unfortunately, this was one must-see I wasn’t going to get to see this time. Luckily for me (and you) though, a travel blogger friend of mine, Raymond Walsh from Man on the Lam, has already written a great post on Buddha Park. 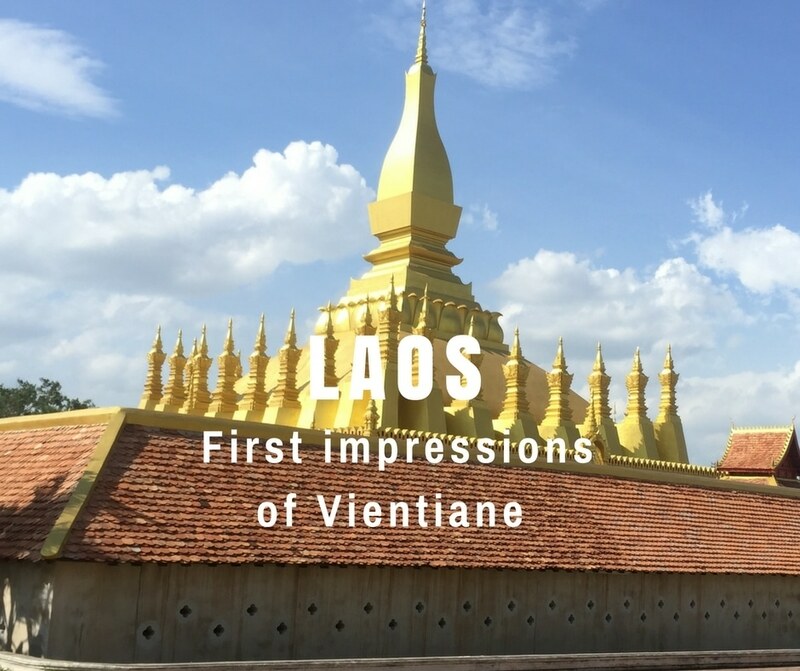 Although I only had a short time in Vientiane I actually managed to fit in an awful lot (in fact, this post could also be used as a one-day itinerary). I was also really pleased to find that despite the not so positive reviews I’d read, I actually rather liked it. Compared to many other places in Asia, it was relatively quiet and clean, especially for a capital city. It was was also more European than other places I’ve visited in South East Asia, with wide paved roads (some with multiple lanes) and colonial buildings. It also appears to have a much slower pace of life compared to most capitals – you need to be prepared to wait for things and for delays. Take your time, slow down, relax, and enjoy Vientiane at your leisure. Finally, a huge plus point for me was the ‘real’ baguettes and cheese that were readily available (if only I’d discovered them sooner), these alone would probably have been enough to sway me! 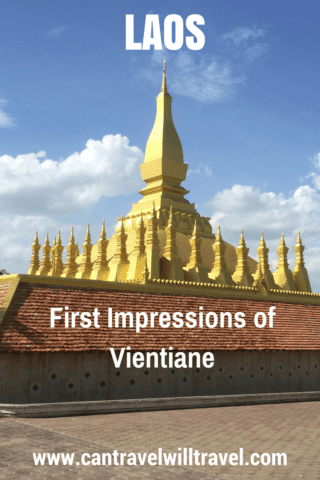 Have you been to Vientiane? How did you find it? No worries, I hope you found it interesting. Vientiane seemed like a dusty overpriced shithole. Prices are on par with Shanghai, where I live, with many things more expensive. Poverty on one side and being “pricy” as you put it – don’t recommend to anybody. A hotel cost us 62$, because even for 25 dollars you get broken AC and bedbugs. Thank you, never again. Sorry you had such a bad experience, I was concerned I’d find it the same but whilst it’s certainly not the best. place I’ve visited I was pleasantly surprised. My accommodation was fine too and much cheaper than $60 USD – maybe I just got lucky or you unlucky! Either way sorry you didn’t have a good time there, everyone has different experiences of places I guess! wish i can visit again here this summer..
Looks amazing! We’re planning to head to Laos around the end of the month, and can’t wait! I hadn’t heard of the COPE Center, we’ll definitely check that out while we’re there. Yes definitely give COPE a look! Have a great trip! Looks like a beautiful fascinating city! I loved that you included history. The cluster bombs and after effects incredibly sad. That buddha parks looks so cool. I had seen pics of it and wanted to go there but I only made it to Luang Prabang on my recent Asia trip (another awesome place if you have the chance to go back). I was laughing at the part about banana panacakes. LOL So true! Breakfast of champions. Glad you got to experience this city for yourself! Yes I thought it was a great little city! 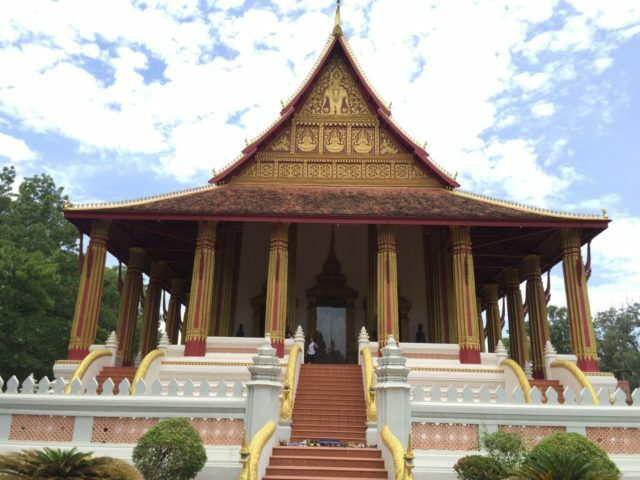 I also visited Luang Prabang which I loved. Will be writing about that one soon!